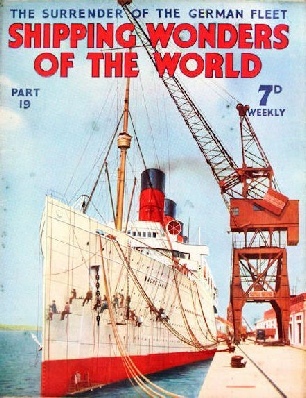 Part 19 of Shipping Wonders of the World was published on Tuesday 16th June 1936. 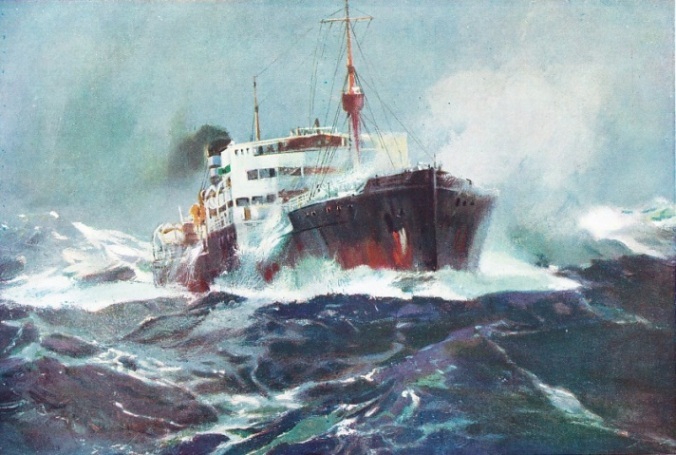 This issue included a colour plate illustrating “Oil on Troubled Waters” from the painting by Frank Mason. This accompanied the article on British Shipping. The coloured plate was attached to page 589 of this issue. This week’s cover shows the Mauretania at Southampton being painted white for a holiday cruise. Before she was broken up this famous Cunard White Star liner made several popular cruises. This cover was later used as the colour plate issued with part 49. The story of the salvage of the German submarine UC 44, concluded from part 18. You can read more about this salvage in chapter IX of David Masters’ book The Wonders of Salvage. On all the seas of the world will be found vessels of different types flying the Red Ensign. It is the symbol of the greatest Merchant Service ever known and a flag that unites with a common bond seamen of many races. This service is still the biggest Merchant Service, and the Red Ensign is worn by most types of ship in some corner of the Empire or other. This chapter is by Frank Bowen and is the first article in the series Sea Transport of the Nations. This excellent example of the work of Frank Mason RI, the famous marine painter, shows a typical oil tanker battling with heavy seas. There are many varieties of tanker, but they all retain certain characteristics. They are relatively long, with the machinery space aft. Built for the carriage of crude oil and its derivatives in bulk, they are divided longitudinally and transversely into tanks. An expansion space is provided to allow for any alteration in the volume of oil in different temperatures. Normally, tankers carry no outward cargo, but occasionally they take fresh water to oil-yielding districts, some of which are waterless. The vessel illustrated is a steamer, but oil-engined tankers are now common. In a previous example (see page 368) we have seen something of the characteristics of the normal trawler. Such a vessel has bluff bows, high sheer and, for reasons of trim, deep draught aft compared with that forward. Above is a vessel which has many of the attributes of the trawler, but a much greater speed and a line of keel almost parallel to that of the deck. Outwardly she resembles a trawler. This resemblance is designed so that she may, without revealing her identity, approach fishermen breaking regulations. Once her identity is revealed, however, her speed is more than enough to ensure her catching the law-breaker. This is the fourteenth article in the series Merchant Ship Types. 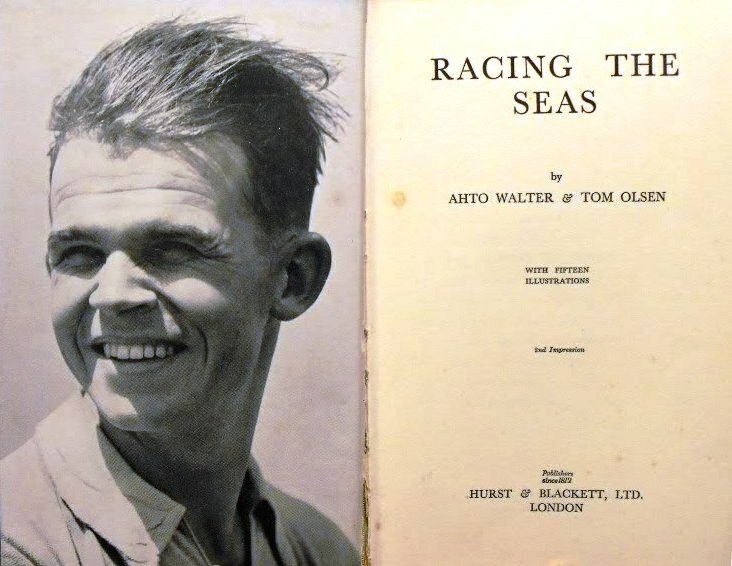 Ahto’s and Olsen’s memoirs of his voyages were published in 1935 under the title Racing The Seas, the title page and frontispiece of which are illustrated below. On November 21, 1918, the mighty German High Seas Fleet was handed over to the British Fleet for internment at Scapa Flow, in the Orkney islands. Before peace negotiations had been concluded, however, the German sailors scuttled their ships. Germany was to be deprived of all naval power. The terms of the Armistice were severe, but the original Admiralty proposals were even more severe. They proposed the complete surrender of the Fleet; but the Allied premiers decided that only the submarines were to be surrendered and that internment of the remaining German naval forces to be handed over was the most that could be demanded. This article is written by Vice-Admiral Gordon Campbell and is a first-hand account of the surrender and sinking of the German Fleet in 1918. 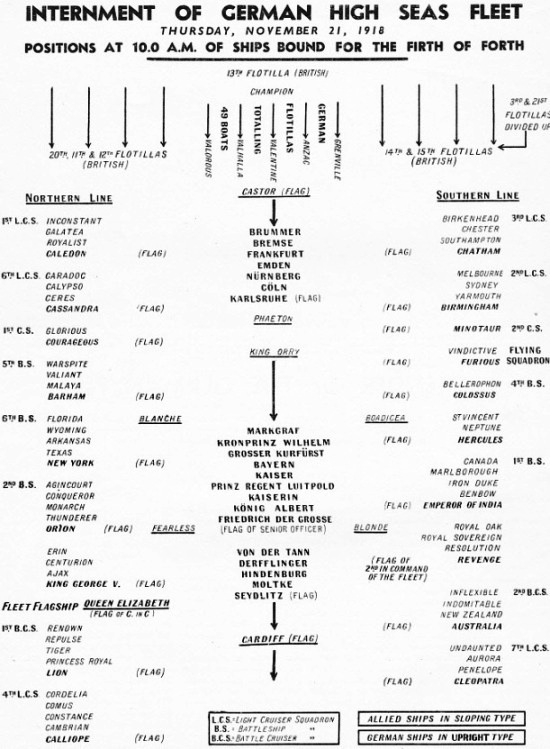 The story of the raising of the German Fleet is told in part 23. Steamships had been propelled by paddle wheels from the earliest days until the middle of the last century, when experiments with screw propellers were successfully carried out and the screw-type marine engine was gradually evolved. It was not until the paddle steamer had reached a high standard of efficiency that the screw propeller was generally adopted by the marine engineer. This chapter is by F E Dean and is the fourth in the series Marine Engines and Their Story. One of the earliest civilizations of mankind was centred on the River Nile, which brings life to thousands of miles of African desert. Some of the picturesque river craft on this great waterway have features derived from the boats of ancient Egypt. Few waterways can compare with the River Nile fro romance. The River Nile saw first the raft of reeds, then the boat made of reeds and wood, and later the sea-going ship of the ancient Egyptians. To-day, as in the past, the Nile is a great highway of commerce and the main artery of Egyptian life. This chapter is by Sidney Howard and is the sixth article in the series on World Waterways.